Find out when and why to get rid of stored gasoline—and how to revive old fuel to power your equipment and vehicles. Q: I’m not sure if the gas sitting in my garage is fit to use in my lawnmower. How long does gasoline last in storage before it goes bad? A: You’re wise to wonder about the shelf life of stored gasoline, because once gas loses its engine-igniting ability it could damage fuel system components. Indeed, before using any stored gas in a mower, tractor, or other piece of equipment or vehicle, first check the fuel storage time limits laid out in the manufacturer’s guidelines—filling engines with gas in storage for longer than these limits could void the product warranty. But “old” gas is not necessarily “bad,” in other words, contaminated. 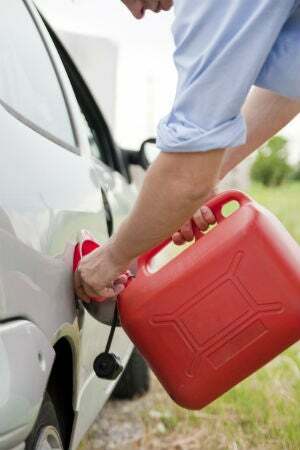 Read on to learn how long you can expect gasoline to last, along with tips on spotting and disposing of gas gone bad. Properly stored gasoline can last up to half a year. Though it naturally degrades and loses combustibility over time due to oxidation (exposure to oxygen) and evaporation of its volatile compounds, gasoline usually lasts three to six months when properly stored in a labeled, tightly sealed plastic container or metal tank (either of which can be shipped to you from Amazon) of the capacity recommended by your fire department (usually no more than five gallons) and kept away from heat or ignition sources in a room-temperature detached shed or garage. The purity of the gas and the use of fuel stabilizers can shorten or lengthen its life, however. Ethanol-blended gas lasts up to three months. According to the U.S. Energy Information Administration, most gasoline sold in the U.S. is “E10” gas made of 90 percent petroleum-based gas and 10 percent ethanol (ethyl alcohol). Ethanol-blended gas usually has a shelf life of up to three months because of the high speed at which ethanol oxidizes. Because ethanol is hydrophilic (a.k.a., water-loving), it will also readily absorb any water or humidity in a sealed container resulting from condensation, causing both moisture contamination of the fuel and the eventual separation of the fuel into distinct gas and ethanol layers. Generally, the higher the ethanol content in the gas, the shorter its shelf life, so E15 (15 percent ethanol content), E20 (20 percent ethanol), or E85 (85 percent ethanol) gas will expire sooner than E10 gas will. Pure gasoline keeps for at least six months. Petroleum-based gasoline without any ethanol will still succumb to oxidation and volatile compound evaporation in a sealed container or tank, but these processes usually occur more slowly in pure gasoline, so you can usually expect it to last at least six months when properly stored. Because pure gas is hydrophobic (a.k.a., water-hating), it doesn’t absorb water or humidity as ethanol-blended gas does, which allows you to avoid moisture contamination and fuel separation issues. Fuel-stabilized gasoline keeps for one to three years. Fuel stabilizers (available on Amazon from brands like STA-BIL) are petroleum-based additives you can mix in with gasoline prior to storing it to slow oxidation and volatile compound evaporation and extend the shelf life of the gas. Depending on the product, the stabilizer can increase gasoline shelf life to between one and three years. Stabilizers work best when you mix them with new gasoline; they’re ineffective at slowing the degradation of old gas, and they can’t return contaminated gas to working order. Spot the difference between old and contaminated gas. The easiest way to assess the condition of gas is to pour a small amount of your stored gas and freshly pumped gas of the same type into two clear glass vessels and do a side-by-side comparison. If the gasoline is only slightly darker than the fresh gas or smells sour, it’s merely old and has probably lost efficacy, but isn’t contaminated. If you observe separate layers of gas and ethanol in an ethanol-blended gas (generally, the gas layer will be darker and positioned above the lighter ethanol layer if the fuel has separated), or if the gas is significantly discolored (i.e., the color of milk chocolate or rust) or contains sediment or sludge, it has been contaminated by moisture or the solid by-products of oxidation, respectively. Contaminated gas should never be used to power equipment or vehicles; it can promote corrosion or leave sludge or varnish deposits (a thin, transparent brown or orange film) on fuel system components that can irreparably damage them. 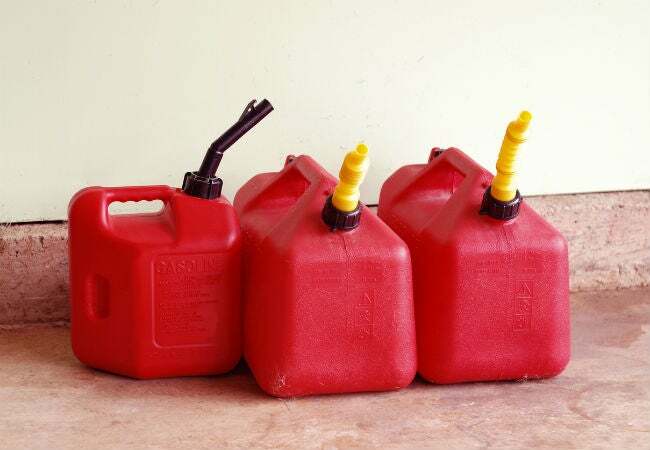 Dispose of contaminated gasoline at the earliest opportunity because, poor combustibility aside, both the gas and the vapors it emits are still flammable and could cause a fire or explosion if the storage container were to become damaged over time and the gas were to leak into its surroundings. Old gas can be used when freshened up with new fuel. Old gas is still reusable if combined with fresh gasoline, although the fuel mixture will have lower combustibility, so you might experience engine sputtering or non-starting. 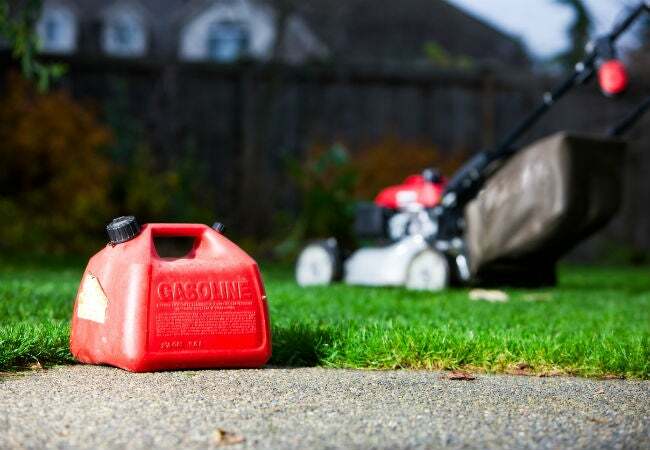 To use old gas in gas-powered lawn equipment, fill the fuel tank with one-part fresh gas per one-part old gas. Starting a car will require more horsepower, so if you recently filled the gas tank three-quarters of the way with fresh gas, top it off with old gas and then try starting the car. Dispose of gas at government-approved sites. Never dispose of gasoline in trash cans, drains, sewers, lakes or streams, or on the ground—it’s highly flammable and can contaminate local water sources. To safely dispose of old or contaminated gas, contact your city waste or fire department for the approved disposal gasoline site. When you’ve identified a suitable site, ensure that the storage container is sealed, then stash it in a cooler or large bin to prevent gasoline leaks during transport. Empty the contents of your gas container into the waste receptacle at the disposal site so you can reuse the container in the future.